At Amberley Museum in Sussex there is a Belliss & Morcom engine operating from industrial vacuum cleaners. We wondered whether vacuum operation could be used instead of steam on our beam engine. In January 2018 a test was done with three existing vacuum cleaners. While they were not powerful enough to "pull" the engine round continuously, they did extend the free-wheeling rotation after the electric barring motor was switched off. Enquiries were then made to nine suppliers of vacuum exhausters, one of which gave us a satisfactory technical offer at an acceptable price. 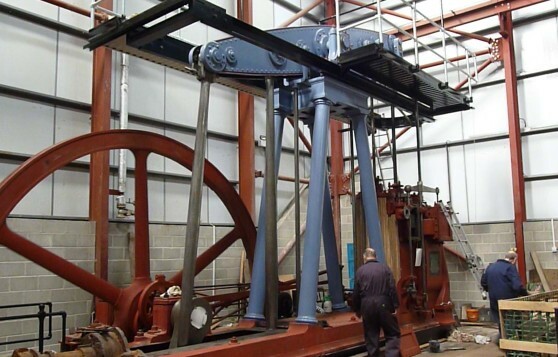 At our AGM in March 2018 we had a full discussion, weighing the merits of connecting the beam engine onto the steam and exhaust systems versus an independent (and simpler) vacuum installation The meeting agreed to vacuum, a useful benefit being the facility to demonstrate the engine in motion during boiler-outage periods. 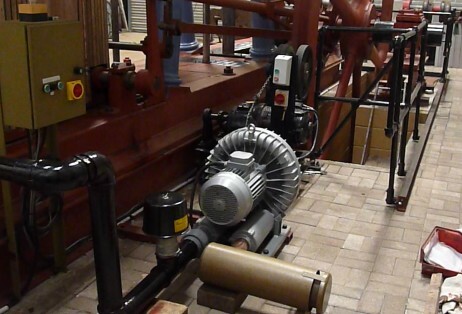 The ESAM "Unijet" 500 exhauster with direct-coupled 7.5 kW electric motor was delivered in May, followed by the purchase and installation of the 3" vacuum pipework from the engine's exhaust connection, and a power cable the full length of the Museum. A first test in July gave about 4.1/2 rpm, compared with only 1/2 rpm from the barring motor. Some "fine tuning" for the higher speed has followed on. As with steam drive, the crank must be barred to an off-dead-centre position before the vacuum can be effective. An electrical interlock is included to ensure that the barring drive is lifted clear of the flywheel rim before the exhauster motor can run. An interesting "philosophical point" is that this is now a double-acting "atmospheric engine", as was the original single-acting Newcomen engine of 300 years ago, because it is not actually driven by vacuum but by atmospheric pressure on the LP piston when the air is extracted from the opposite side by the exhauster. The alternating application of the vacuum is through the slide valve in the normal way. during its exposure to 45 years of English weather. The ESAM "Unijet" 500 exhauster with direct-coupled 7.5 kW electric motor. 3” pipework connected to the engine exhaust. Now running at just over 4½ RPM, via a vacuum, created by the above vacuum pump.